The end of 2018 means three things – making plans for New Year’s Eve, choosing resolutions for the year ahead, and pouring through the endless “Best of 2018” lists that keep popping up on your social media feeds. 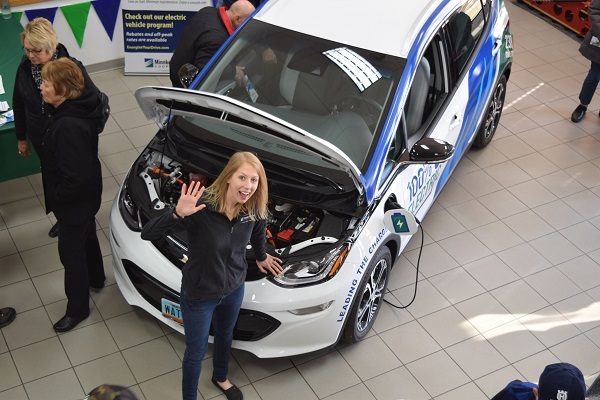 When I started at Minnkota Power Cooperative this April, I had no idea that three months later I would be in the driver’s seat of an all-electric Chevy Bolt, cruising around the region and showing folks what that unassuming little car could do. Over six months, I’ve had some real “Dear Diary” moments. It was hard to pick my favorites, but these experiences rose to the top. When I was asked to do a live radio interview with Thief River Falls’ favorite radio personality, Key Teeters, I panicked. What if I said something silly, or didn’t have the answers to her questions about electric vehicles? My panic grew – just a little – when she said she wanted to take a test drive and post the video on Facebook. What ended up transpiring was a lovely and informational interview followed by one of the most fun test drives to which I’ve had the pleasure of being a passenger. Key was a riot! She put the pedal to the metal and giggled and gasped through her whirl around a few city blocks. Check out the whole ride below! Before my Minnkota colleagues started to wonder why the new communications specialist was driving all over the countryside in a bright blue, green and white attention grabber, the communications team decided it was important to teach our co-workers about the new all-electric addition to the fleet. 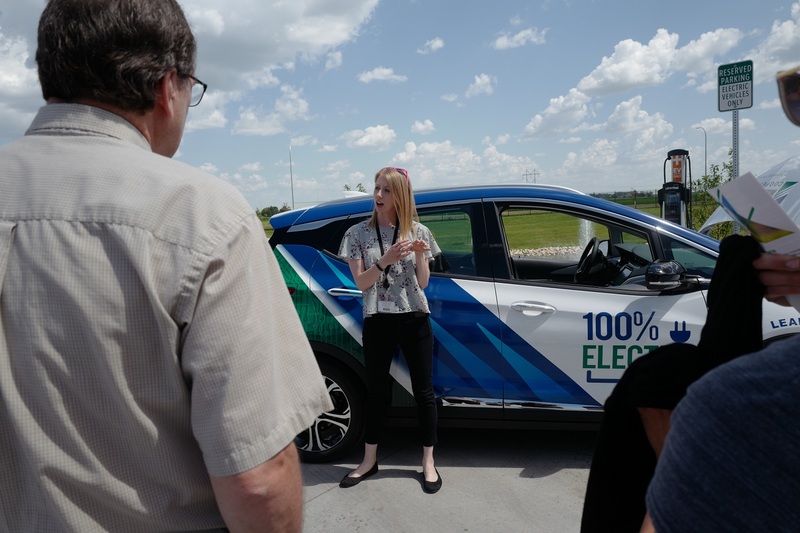 The team put together a Minnkota EV Day in which every employee had the chance to check out the car, see how it charged, learn how to log travel data and ask general questions about the technology. But the best part? A sign-up sheet for test drives. 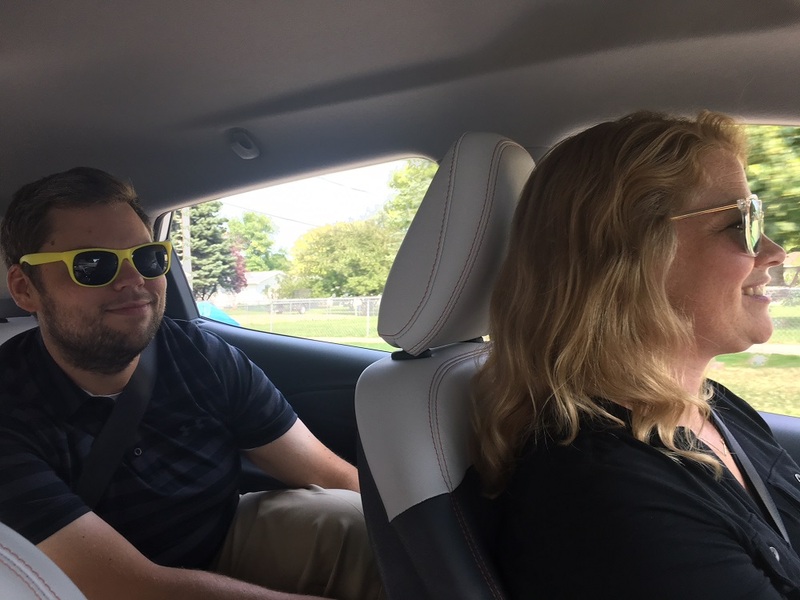 All week long, I got to watch from the passenger’s seat as I saw our accountants, engineers, administrative assistants and more light up as they felt the power and handling of the EV. It was way too much fun. Check out the testimonials here. 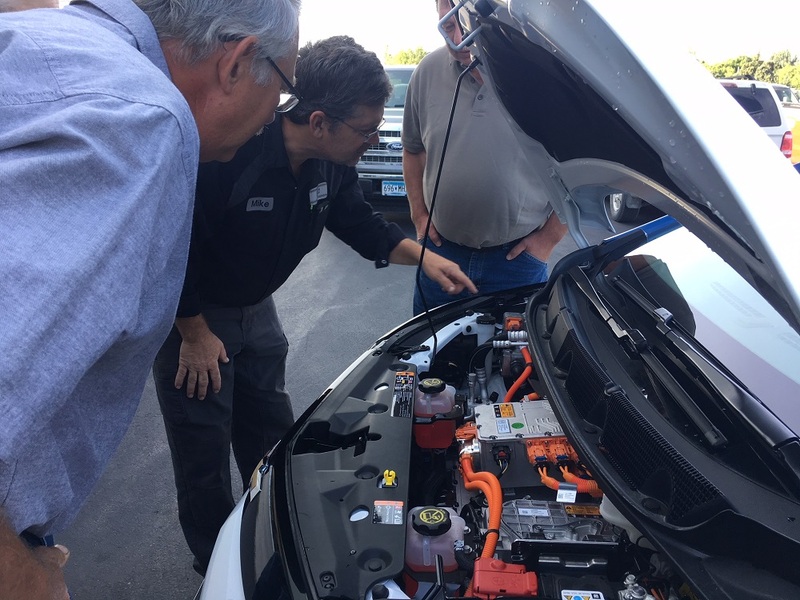 We kicked off a week of test drives with a walk-through of the capabilities and features of the EV, as well as a demonstration of how to use Minnkota's onsite charging station. Sean Devine (left) and Sarah Lundeby (right) from Information Technology both took a turn at the wheel. Sarah had the best acceleration reaction of the week: "Seriously! I lost my stomach like I was on a fair ride!" 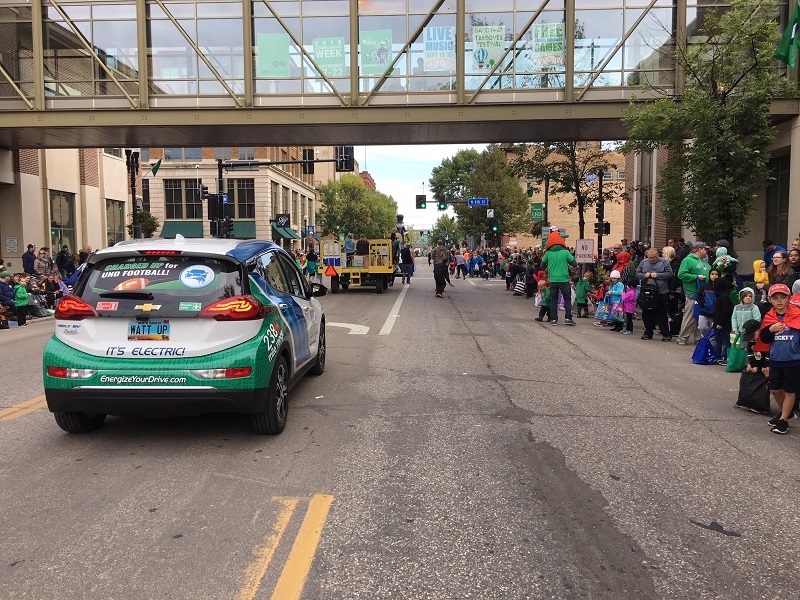 This September, my communications teammate Ben and I took the Bolt through the combination UND Homecoming/Potato Bowl Parade in downtown Grand Forks/East Grand Forks. Ben drove the whisper-quiet car and I ran alongside it, tossing mini chocolate bars at the thousands of people lining the streets. People shouted questions about the EV, amazed at just how silent it was. But who could really tell over the chatter and cheering? The atmosphere was – excuse the pun – electric. See all the pomp here. The turnout for the Potato Bowl Parade is always huge, but the pairing with this year's UND Homecoming celebration made it a must-attend event. We had just enough candy to cover everyone! National Drive Electric Week fell on September 8-16 this year, and it was the first year that Minnkota was able to take part with its own EV. I took the Bolt to events and gatherings in Grand Forks, Bemidji, Mahnomen and Fargo. The Fargo meet-up was tough to beat. 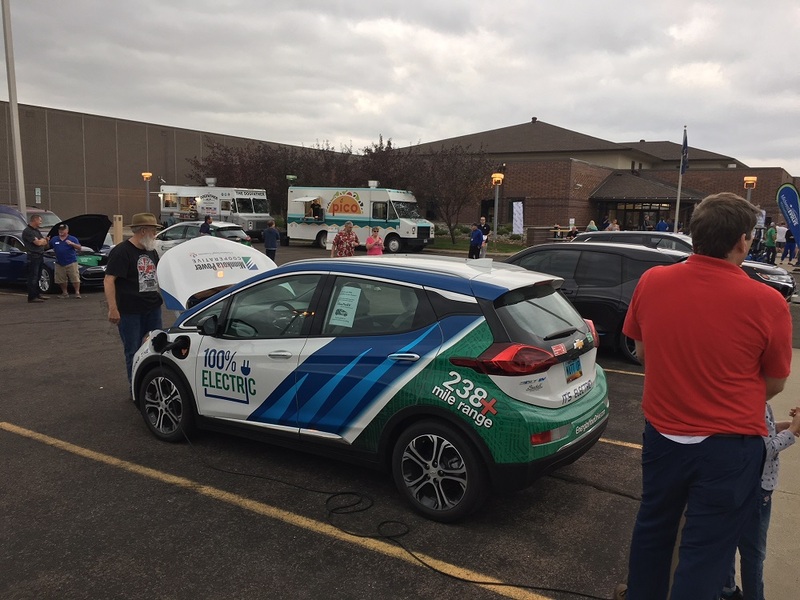 Cass County Electric pulled out all the stops with free food trucks, swag giveaways and example of electric transportation ranging from bikes to hybrid buses. More than a dozen plug-in car owners showed up to the tailgating party, including brothers Bill and Jim Brooks in their Tesla Model S.
They offered me a test drive. I took them up on it. Enough said. Get the full ride here. The Minnkota Bolt was just one of several EVs filling the parking lot at Cass County Electric in Fargo. It was a perfect way to show the community the range of models available and allowed them to ask the owners about their real-world experiences. 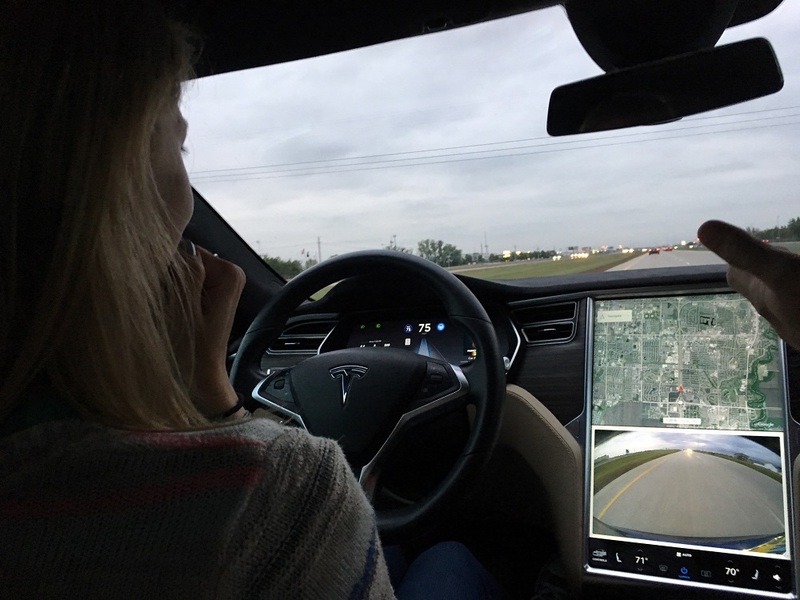 Tesla owner Bill Brooks showed me the autopilot mode on the interstate. It was terrifying, but the technology guided me along without a fault. Kudos to you, Elon Musk. My top EV moment of the year is actually a full set of moments pieced together over four days and 866 miles. The Co-op Hop was my way to introduce myself to the world of long-range EV travel, and to introduce our member-cooperatives to the Minnkota Bolt. I traveled across eastern North Dakota and northern Minnesota, visiting more than a dozen communities and spreading the EV gospel along the way. I met loads of new people, gathered a ton of data and learned so much about both EVs and the co-ops we work so closely with every day. It turned a gig into a dream gig. Read more about the journey here. And here. And here. And here. Along the hop, I passed out sunglasses with EnergizeYourDrive.com printed on the side. 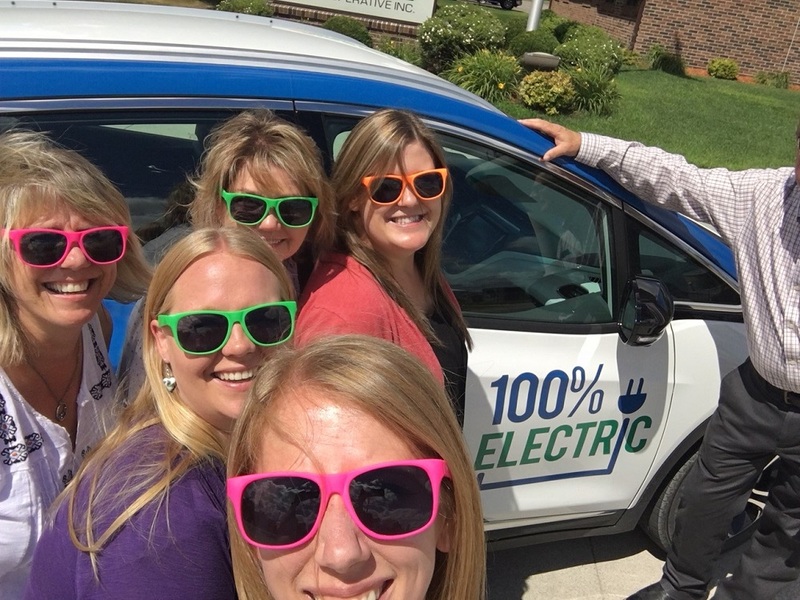 I mean...the EV future's so bright we gotta wear shades, right? The crew at Roseau Electric was incredibly intrigued by the technology under the Bolt's hood. 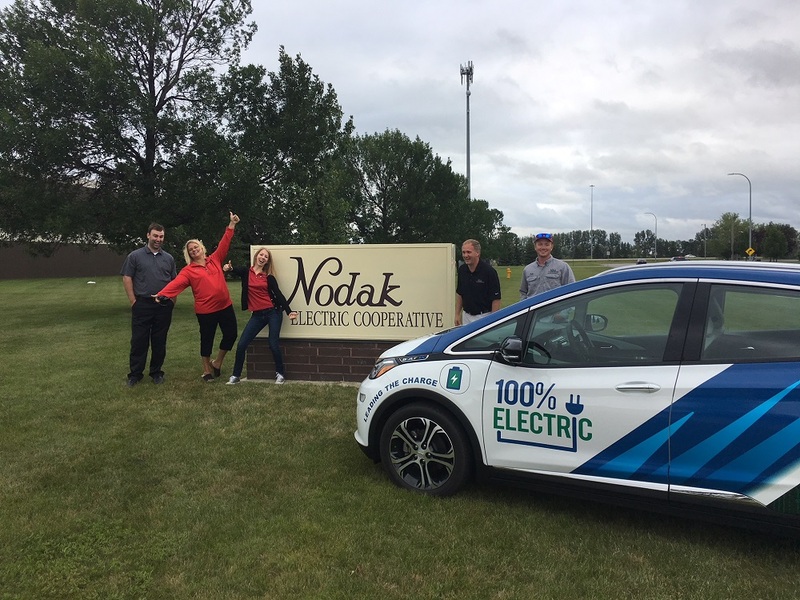 Even though I popped over to Nodak Electric bright and early, the team was game for a fun photo shoot with the car on my last leg of the hop. Here's to many more EV memories to come in 2019!